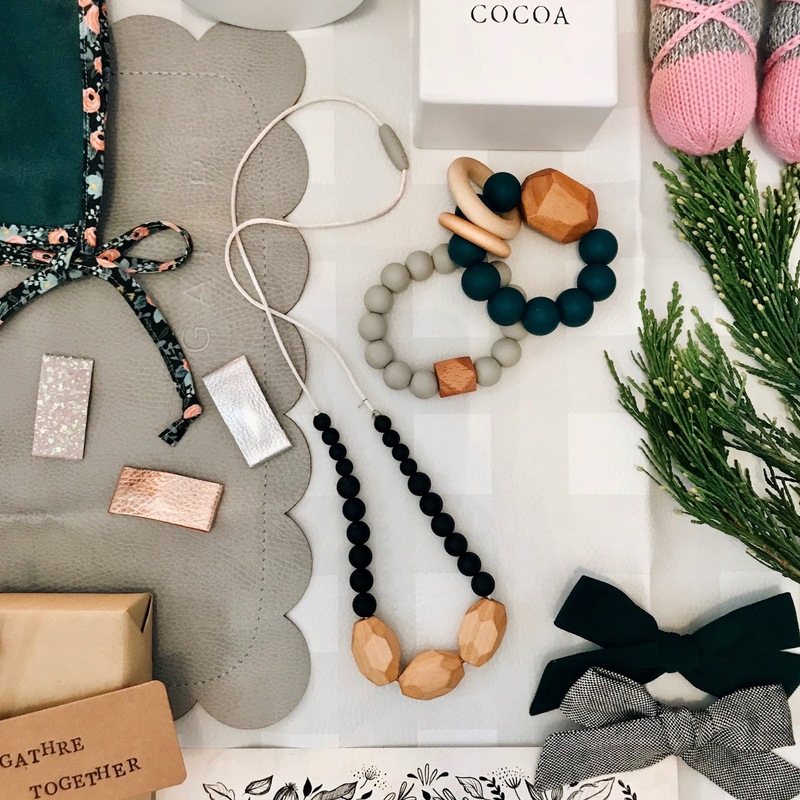 Last year I put together five individual gift guides each featuring 5 shops & items and I thought it would be so much to do one big gift guide this year with all my favorites in one place! Included are gifts from my fav shops for babies, kids, mamas and friends! 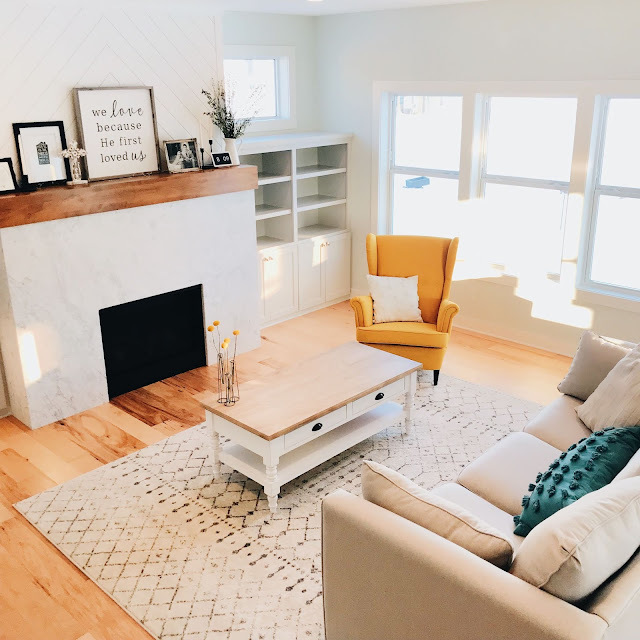 These are all shops I have had the pleasure of working with over the past few years and remain my top picks anytime I am looking for something for myself, my daughters or my dearest friends. 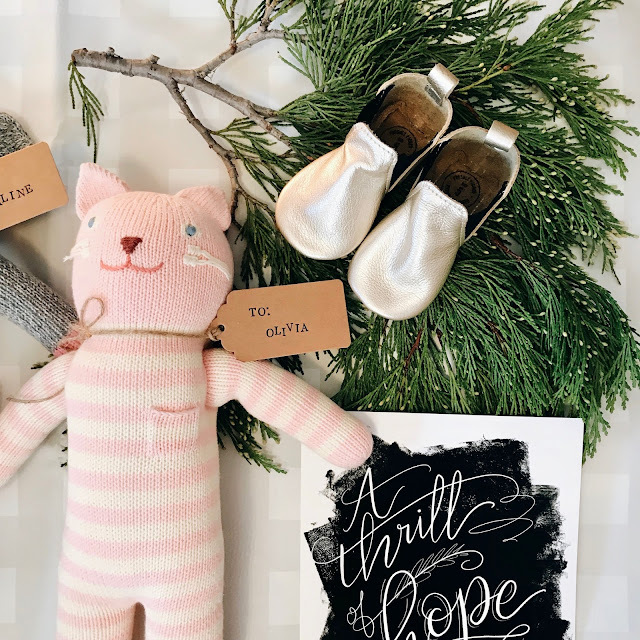 Run by best friends Allison & Rachel and known for their incredible handmade boots & shoes, I knew I had to put some Adelisa & Co goodies under the tree this year for my girls. Poppy has a pair of paseo leather boots so I grabbed the same style for Della to wear. For Olivia, I chose the cosecha mary janes. I cannot even begin to describe how timeless and lovely they are. To me they are such a beautiful symbol of her growing in to a young girl; I know she is going to go on many adventures this Spring & Summer in them! Every pair of boots & shoes is handmade by artisans in Nicaragua and you guys, the craftsmanship is out of this world. 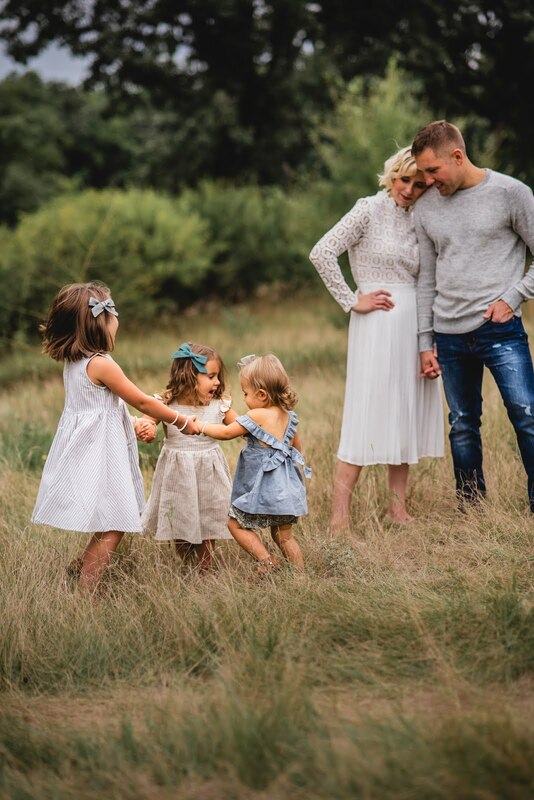 Not only are Rachel & Allison amazing for their commitment to work directly with artisans and pay fair prices so the artisans' families are supported, but they also give back 10% of proceeds to young families in Nicaragua who are in need. If you want to know when the next preorder for boots and shoes is, you can sign up for the Adelisa & Co newsletter to be the first to know specific dates + times. They sell out quick so if you have your eye on a pair, that is the way to go! I have shared many times about our love of Blabla Kids knit dolls. They are hands down my girls' favorite stuffed animals and they're so darling that I don't mind if they're left laying on my couch or coffee table. 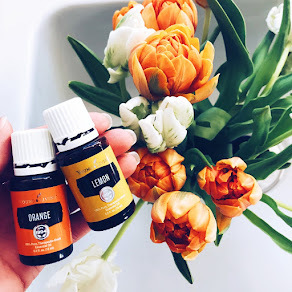 My girls love to snuggle them during naps and bedtime, set up tea parties for them, take them on outdoor adventures and even put them in their backpacks and carry them around the house all day long. I picked out a new doll for each of the girls and had so much fun making handstamped tags for them. Olivia wants a cat so bad (she thinks they pee in glitter boxes) so I chose Rose the Cat for her. Poppy is our wild at heart, outdoorsy one of the bunch so I grabbed Jasper the Deer for her. And Della doesn't have much of a say in the matter so I picked out Josephine the Elephant for her, which will match a quilt she has in her nursery. 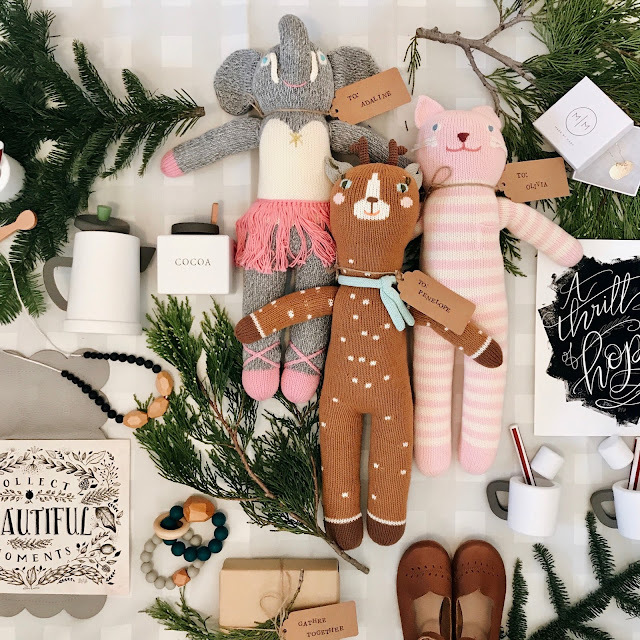 When I pick out gifts, especially for my girls, I tend to focus most on a handmade holiday. I want to give gifts to them that others have put time & love in to; those are the things I know will be genuinely cherished. BlaBla Kids products are all made by hand by artisans in Peru, knitted with the highest quality Peruvian cotton (they are so soft!) and thoughtfully designed + created step by step. 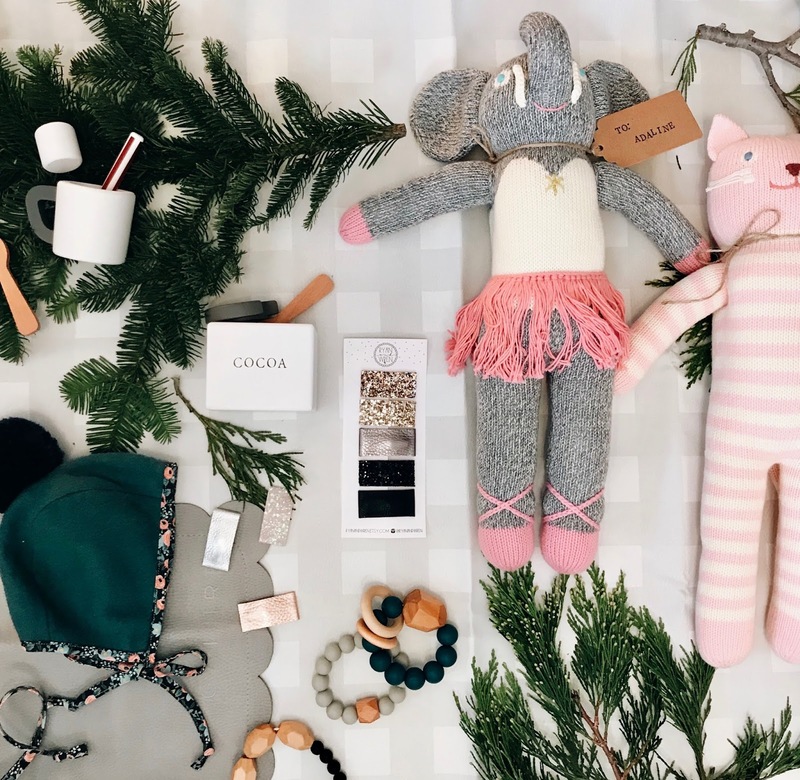 When you invest in a knit doll from BlaBla, you are supporting artisans and their families who they have been working with for 15 years; Blabla believes in fairtrade and sustainability, and all their dolls have been tested to meet both the United States and European safety requirements. Use code BLESSEDNEST15 for 15% off your purchase from BlaBla Kids now through December 12. Lets just be honest. If you have babies, there is almost nothing sweeter than to put them in bonnets. And our favorite bonnets ever come from Briar Handmade. Della will be getting two in her stocking this year, a pom bonnet and a floral bonnet for Spring. Bonnets make the perfect stocking stuffers and thoughtful gifts for friends who are expecting or just welcomed a new baby. They are heirloom quality and we have bonnets from when Olivia was a baby that Poppy and Della have both worn. Passing down handmade items is one of the sweetest parts about having three little girls, especially bonnets. A stocking isn't complete without one. Use code BLESSEDNEST10 for 10% off your purchase from Briar Handmade now through December 15. Having had three babies in 5 years, I've tried just about every teether out there; I'm so excited to be including Chewable Charm, in this year's gift guide. I absolutely love Rachel's modern teether rings and stylish teething necklaces, the perfect gift for a new mama or mom to be! Adaline will be getting the shaded spruce wood teether and forest grey teether in her stocking this year, perfect timing for the tiny teeth that will be making an appearance any day now. 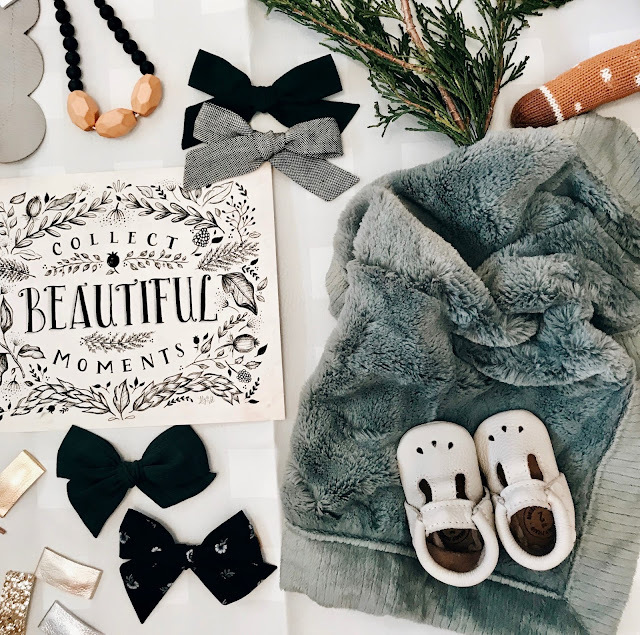 Rachel designs simple, neutral pieces that work with any mom's style, and her necklaces & teethers are definitely something you won't mind throwing in your diaper bag or giving as gifts. They are well made and just so pretty. Use code BLESSEDNEST for 20% off your purchase from Chewable Charm now through December 15. 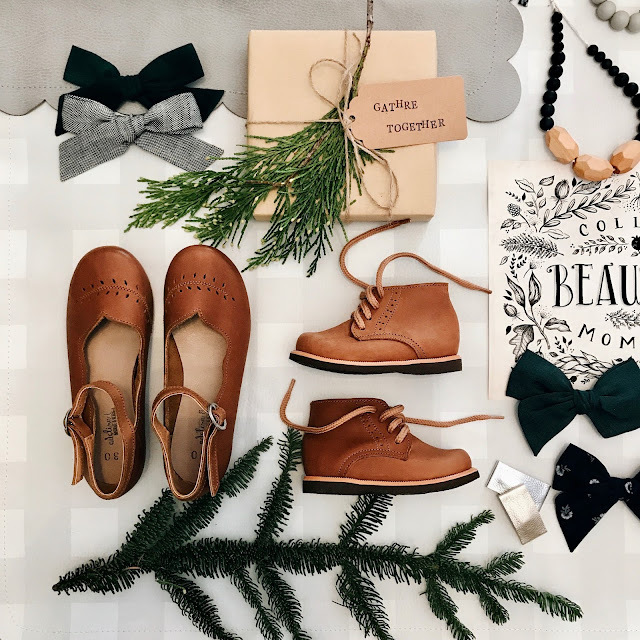 In Penelope and Adaline's stockings this year are our fav moccasins and mocc boots from Freshly Picked, including Mary Jane's in Birch for Della and Chelsea Boots in Platinum for Poppy. Soft soled shoes are often the best for little feet because they don't restrict growing bones. I love selecting neutral colors so they match whatever the girls are wearing. We have been fans of Freshly Picked since Olivia was born in 2013 and they remain at the top of my list for so many reasons! One of my favorite gifts to give new mamas is a gathre micro mat, which is the perfect size for changing diapers. I especially love the scalloped ones, which come in three colors. With three little ones and a three-story home, I rarely carry Adaline all the way upstairs to her nursery where her changing pad is. Instead I have diapers and wipes stashed in cute baskets throughout the house so they are always within reach; I just keep a micro mat rolled up in them so I can change her wherever I am. And of course we love their midi and maxi mats for picnics, arts & crafts indoors and out, book-reading, puzzles, games, family photos and more. If you don't yet have a gathre mat, they are the perfect item to add to your Christmas list this year or give to that special someone. I love a good art print and Lily & Val makes picking a favorite very difficult. From the beautiful chalkboard illustrations to the meaningful quotes and messages, every single art print is just a home run when it comes to gifting. They are the perfect gift for a close friend, especially if you put it in a simple, coordinating frame. A few of my favorites include the All is Calm print (so neutral + the one we have in our kitchen), A Thrill of Hope print (from one of my favorite Christmas songs, O Holy Night), the Collect Beautiful Moments print (from this year's Fall collection), the Hot Cocoa Recipe print (I love framing this when I host Christmas parties with my girlfriends and set up a hot cocoa bar) and this Flamingo print which I have framed in Poppy's room. Use code BLESSEDNEST for 15% off your purchase from Lily & Val through December 9. 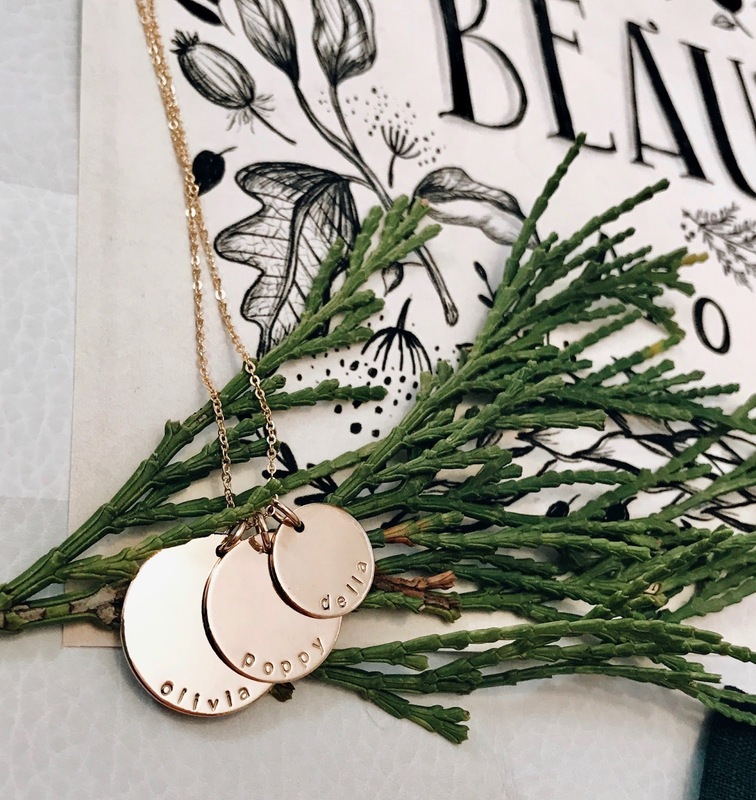 As a Mama, personalized jewelry with my daughters' names is my favorite kind of jewelry to wear because I feel like even when I am gone, there is a part of them that goes with me and I get to honor the gift that each of them are to me by wearing their names, birthdates or initials. Started by Mary Moody in 2013, Made by Mary is the best of the best when it comes to handmade, high quality jewelry. MBM offers bar necklaces & disc necklaces as well as bracelets, rings and more. I have a set of 3 skinny bar bracelets with the girls' names on each and I love wearing them stacked together. I also love the Everly Bar Necklace for names or initials as well as the Hammered Half Moon Disc Necklace. This year I picked out the Nova Disc Necklace, a newer design from MBM that is just so eye-catching. I had it engraved with each of the girls' names, of course Della got the smallest disc because she's our littlest. I love that you can see their names at all times because of the way Mary designed the discs to lay and the positioning of the text. If you are looking for the perfect stocking stuffer -- or your daughters have friends they want to give gifts to this Christmas -- grab some of our favorite snap clips from Ryan & Wren. They are the only clips I put in the girls' hair; Olivia and Penelope request them every day and I love them for pulling back Poppy's little bangs and for Olivia at school. She has some friends in her class this year she has asked to give gifts to and a clip on a cute holiday tag makes a simple, inexpensive but adorable gift that her friends can actually use. I put together a set for Olivia and a set for Poppy for each of their stockings. I love the glitter and neutral metal toned clips, but Mary has just about every color you could want! 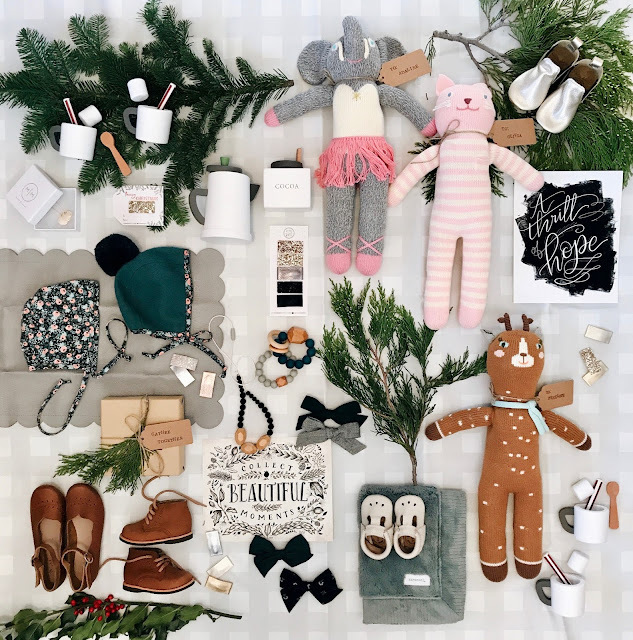 Use code BLESSEDNEST for free shipping on orders over $15 from Ryan & Wren now through December 11. Next, our favorite blankets of all time. I don't know what makes a better gift than a cozy blanket. 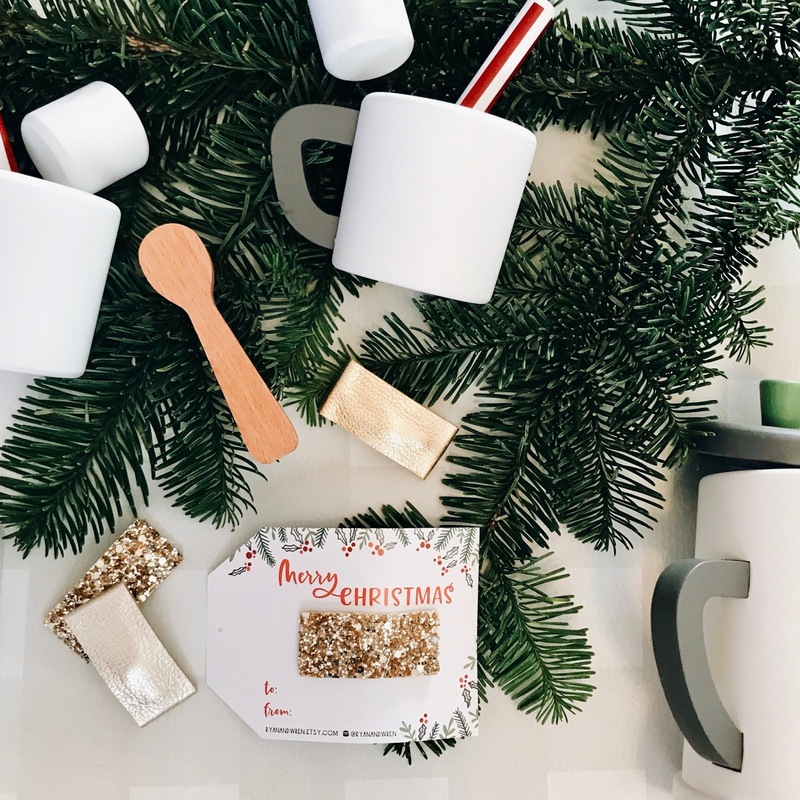 Tie a pretty ribbon around it, add a handstamped tag and give it with a mug & some cocoa mix or tea and its the perfect gift that the receiver can use to curl up and wind down after the busyness of the season. We got our first Saranoni blanket in 2015 after Poppy was born and it remains a favorite with a front and center spot on our living room couch. It's just the right size for the girls. This year I picked out a few Mini blankets for Della's stocking, which I intended to be loveys for her but also make a perfect carseat blanket at 15"x20" / My favorite blanket for movie-watching and snuggling is the Toddler Size, which is about the size of a twin bed and perfect for me to share with one of the girls or Dustin or for Olivia and Penelope to use together. They are luxurious and when draped over a couch or bed, certainly make your house feel like a home. Use code BLESSEDNEST20 for 20% off your purchase from Saranoni now through December 15. No Christmas would be complete without gifting a few of my forever favorite bows. There are so many reasons we love Wunderkin Co...when you shop from Wunderkin you are supporting Stay at Home Moms all around the country, each & every bow has a lifetime guarantee, they are timeless & made with so much love and Hillary founded her company on the idea of creating classic accessories to accompany girls on everyday adventures. She is passionate about raising her own daughters to be confident, curious and independent, which I LOVE. 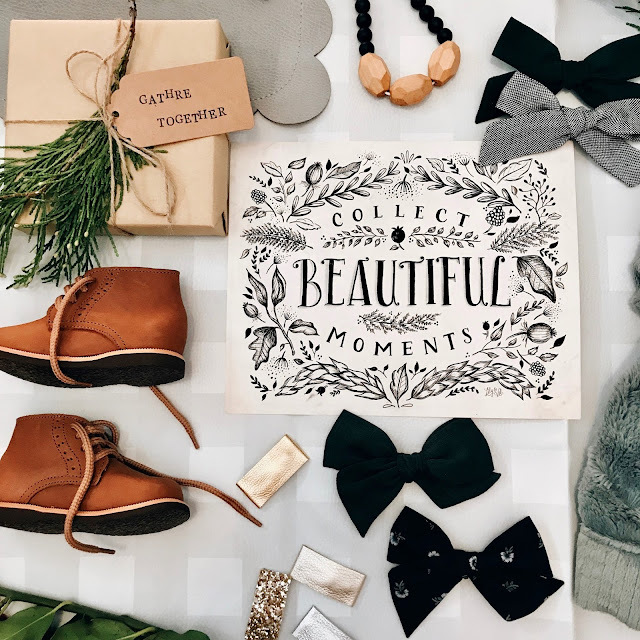 Wunderkin's core values are adventure, courage and whimsy...the perfect bows for gifting this season! What gifts are at the top of your list this year? Have you done most of your shopping or are you just getting started? 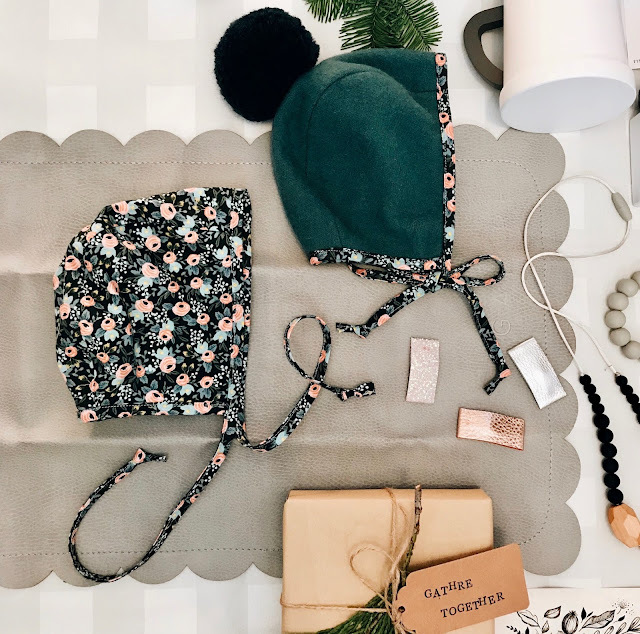 I hope this gives you some new ideas to find the perfect gift for everyone on your list! !